Volumize invites you to design and build in an introductory 3D modeling platform. The creative building environment encourages spatial awareness of the real world, specifically around concepts of surface area and volume. Start with a 2D digital photo, set the scale of the image (so that the 3D models can return approximations of real world values), and then build on top of it with digital representations of 3D solids. Volumize offers 6 basic solids: rectangular prism, cylinder, sphere, triangular prism, cone, and pyramid. Volume of the total model, and for each individual solid. Surface area for each solid and each side of each solid. Total surface area of the entire model, taking into account of the places where faces of solids overlap. Mathematical nets (what a solid looks like unfolded) that change dynamically when the solid is altered onscreen. Volumize lets you play directly with dimension, a concept that can often seem abstract and confusing. Through the process of making, skinning, and discussing your models, you’re constantly attending to 2D and 3D objects at the same time. When you build on top of 2D photos with 3D solids, you supply the third dimension to the scene – the information that was lost when the picture was taken in the first place. As you rotate their model bisected with the 2D plane, you are confronted with the difference between 2D and 3D objects. During discussions about your work, you wrestle with language to make your meaning clear: shape vs. solid, line vs. edge, side vs. face. When you skin the surfaces of your models with colors, textures, or photos, consider the complexity of how the flat 2D image will bend, curl, and stretch around the contours of the 3D shape. All of these experiences help build a rich understanding of dimensionality. Setting the scale at the beginning of the Volumize experience helps bridge the digital experience to the real, spatial world. The iPad becomes a window onto the world, providing information not often available. You can quickly find close approximations, for example, of the surface area of the Empire State Building or other familiar architecture. Classroom activities are designed to inspire beginning to notice the way the world around you is put together, and the amount of space that things occupy. You can become more flexible with numbers, data, and formulas, as you use them to calculate things you care about. The primary content that you will explore is surface area and volume of 3D solids. But along the way you will directly interact with the mathematical nets, dimension, scale, and 3D modeling basics such as rotation of shapes and extruding. All of these concepts help build visual thinking skills that are core to many aspects of mathematics. In each classroom activity, you are guided to discover ways in which surface area and volume are important to models. This data isn’t just abstract – you could build real things with the approximate measurements from Volumize. One activity – Which Is Greatest? – invites you to create models of things in the room of similar size, make predictions of which objects have more surface area and volume, and then test the predictions in Volumize. Treehouse Design invites you to create models of treehouses, but you must be able to both sleep and stand inside with a few friends. 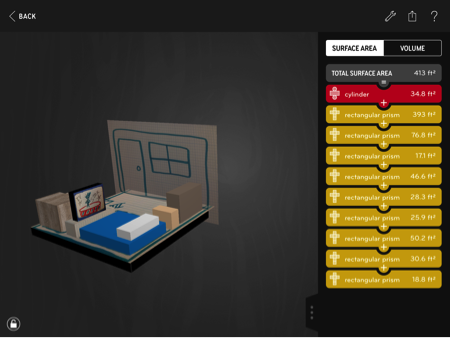 Redesign Your Room takes the traditional “map your room” activity and blows it up into three dimensions, helping you more directly engage with the spatial data you live with. As you build and re-shape these models, all the data is calculated in real time, creating a meaningful link between the solids and the numbers associated with each piece. There is a common misconception about the growth of similar 3D figures: that doubling height, for example, would result in doubling both surface area and volume. However, this is not the case. As long as the overall shape remains the same, as the whole shape gets bigger, volume grows faster than surface area. If something triples in size (gets 3 times bigger), the surface area gets 9 times bigger (32), and the volume gets 27 times bigger (33). As you scale up the shape by any number, the surface area grows by the square of that number, and you scale up the volume by the cube of that number (see diagram). It turns out that this disparity between volume and surface area comes up again and again in science and engineering, in explanations about things as diverse as why building taller and taller skyscrapers is challenging, and why an ant doesn’t suffer damage when falling from a tall height. Volumize tackles this misconception as you set scale in one dimension, and then explore data for both the second and third dimensions. Here’s a brief tutorial to get you started with Volumize.